So my wife had her 22-week ultrasound today, apparently the final one barring any issues, and I took some time off to go with her. This was my third time going to one of these appointments so, for once, I kinda knew what I was in for. Truth be told, for the most part, I just sit there with my mouth shut — it’s not that hard. This time was kinda neat, though… See, if you’ve ever gone to one of these appointments you can’t miss how the women in the waiting room size one another up. It’s hysterical. On our first visit, back in November, it was hard not to notice the other women in the waiting room looking down on us — you know, cause we weren’t “far” enough along. The second visit, well, everyone in the waiting room seemed to be at about the same stage, so the women were obviously sizing up the “support partners” (ha!) in a pseudo my-man-is-better-than-your-man sort of way. Thank god I don’t wear sweatpants in public. Really, by that fact alone, I out-manned one fellow. This time, my wife was the cow of the room. No doubt. One woman across from us in the waiting room was so sheepish about it that she wouldn’t even make eye contact. I couldn’t help but be proud. Yeah, that’s right. My wife is fatter than your wife. Once we were called into the room where they do the ultrasound thing, the appointment went just like the previous ones. Yep, little monster skeleton looking thing in there kicking and squirming. Think… velociraptor. Unfortunately, the images didn’t seem as clear this time — not sure what that was about — but could clearly see the baby opening and closing it’s mouth, so that was neat. Then it was time for the real doctor to come in for a look. Again, it’s just like going to the dentist — the person without the degree does all the work and then the big bad doctor comes in at the end for 5 seconds. Poor grammar aside, I thought it was a pretty strange entrance. I didn’t think too much of it at the time, but later my wife thought he was prying to see if he should bother pretending to be nice, you know, since we’re NOT having the baby at this hospital, he had no problem coming across as gruff. He sat down and took control of the little wand/scanner thing. It was blatantly apparent that he had the personality of a door knob. Now, I was an engineering major in university. I know what you’re thinking; those guys are always a bunch of nerdy dweebs. For the most part, that’s true. What I’m saying is that I’ve hung out with a lot of people with zero personality. I can honestly say that I’ve spent a few Friday nights discussing math — I’m not ashamed to admit it. But here’s the thing — engineers generally only interact with engineers. This guy, on the other hand, is a doctor?! Doctors deal with the public! Further, this guy is a freaking BABY DOCTOR?! I dunno, but I think the med schools out there need to start teaching these guys something about dealing with the public. I mean, to get your engineering degree, you had to pass a communications course that taught you how to NOT speak geek speak all the time. Most of us considered it a “bird” course, but really, for some, I’m sure it had some effect. Anyway, at one point, while scanning all around looking for a nice clear shot of the heart, he lifted his free hand and started scratching the top of his head like an ape. We’re not talking about a discrete index finger itch. This was an all out four-fingered plow-the-fields scratch that lasted over 10 seconds. Un-real. Now, I must admit, I’ve been known to scratch my head like an ape too — usually while driving around in the convertible. I dunno, there’s something about the wind whipping your hair all around that makes your head really itchy. 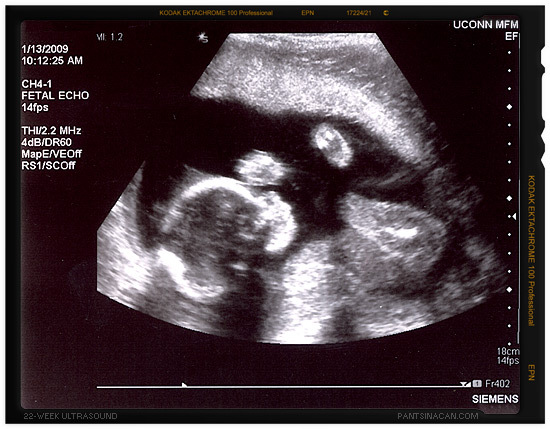 For the record — this is the first ultrasound post that hasn’t included a reference to an action figure. It isn't how MUCH you make, it's what you DO with it. Since When is Change Worth Less?